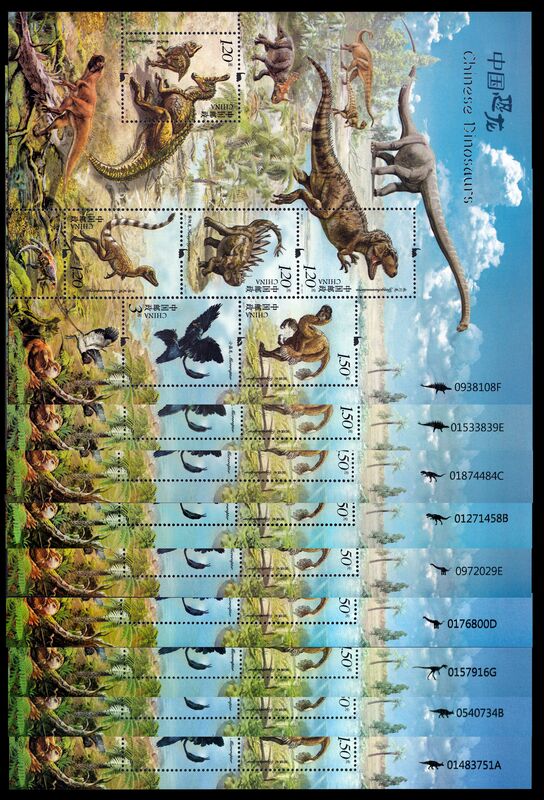 Paleontology related stamps, post marks, post stationary and special covers depicted dinosaurs and other prehistoric animals, fossils, fossil found sites of the year 2017 sorted in chronological order. If you know about any other Philatelic object (stamp, postmark, commemorative cover, etc. ) 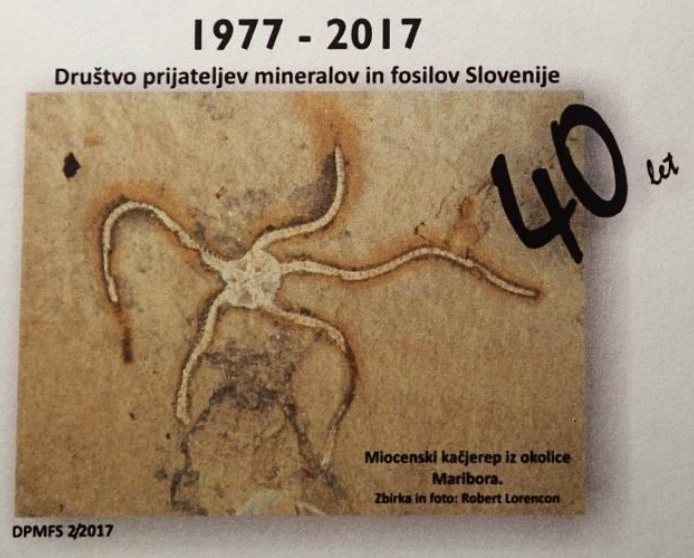 related to Paleontology, issued in the year 2017 which is not mentioned below, please send a message to Admin of this site. Michel catalog"Dino - whole world"
Click on image to enlarge it or to be redirected to description page. Stamps on gray background are Undesired/"Pseudo stamps"
20.01.2017 Ukraine 16.01, 23.10, 20.11, 20.12.2017 C.A.R. At the end of 2016, Serpost presented several new stamps on their Internet site, unfortunately without any detail (www.serpost.com.pe/SellosPostales2016.html). Most of it arrived at postal desks in Peru on beginning of 2017. 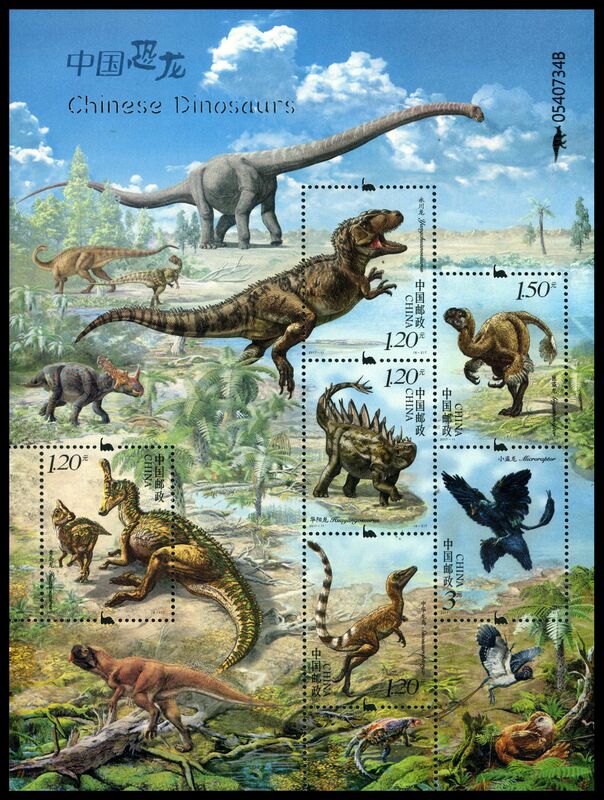 First dinosaur stamps of China since 1958. There are big diversity of Mini Sheet's numbers and dinosaurs silhouette attached to it. 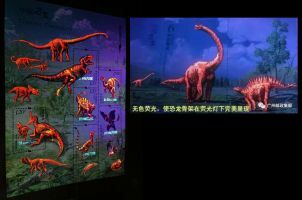 Skeletons of the dinosaurs can be seen under UV light. Many commemorative postmarks and meter franking issued in different cities around the country. Smilodon fatalis, best known saber-toothed cat and Megaloceros giganteus, also called the giant deer or Irish giant deer depicted on "extinct animal" stamps issued by Stamperija on behalf of Niger. This stunning issue features the first Jersey stamp to be printed on wood. Illustrated by Sara Menon, the animals and birds that feature on the stamps are subjects of conservation projects undertaken by the Durrell Wildlife Conservation Trust with support from the Darwin Initiative, which this year celebrates its 25th anniversary. 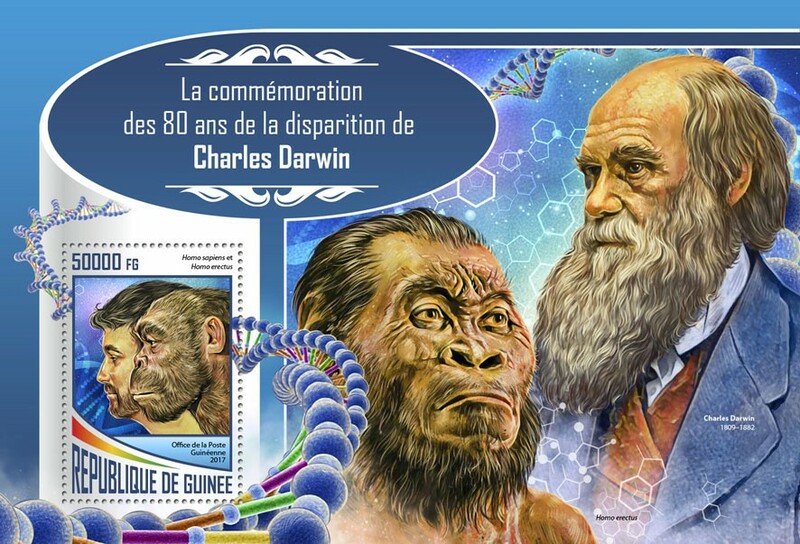 The Miniature Sheet, which has been printed on FSC certified sycamore, features a portrait of Charles Darwin. The fact that the wood grain can be seen through the image means that each Miniature Sheet is unique. The second issue of "National Park" stamps (1st set issued in 2016), have one Paleontology related stamp. 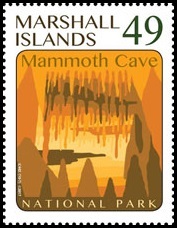 Another stamp shows a landscape of Mammoth cave. No fossils of the woolly mammoth have ever been found in Mammoth Cave, and the name of the cave has nothing to do with this extinct mammal. Rather, the name "Mammoth" refers to the large width and length of the passages connecting to the Rotunda just inside the entrance. This name was given long before the cave system's true extent was fully known. On September 22, post of Nepal issued 3rd set of "prehistoric mammals". First two sets issued in 2013 and 2015. Fossi of all animals depicted on the stamps found in Nepal and are on display in Natural History Museum. The building of the museum depicted on stamp of Nepal in 2014. These stamps issue in cooperatoion with the museum staff, therefore logo of the museum shown on bottom-right corner of every stamp. Sett of mini-sheets that depict a building of North Korean Natural History Museum and some of its artefacts. One mini-sheet dedicated to dinosaurs. The stamp is dedicated to province Teruel, shows varios sighseeing and local food of the area. Dinosaur's head can be seen on the bottom-right corner of the stamp. The head belongs to Aragosaurus dinosaurs. Aragosaurus (meaning "Aragon lizard") was a genus of sauropod dinosaur from the Early Cretaceous period of Galve, province of Teruel, in the autonomous territory of Aragón, Spain. Aragosaurus was a large, quadrupedal plant-eating dinosaur, which lived about 133-125 million years ago. It was about 18 metres in length and about 28 tonnes in weight. Like other sauropods, it had a long neck, a long powerful tail, a small head and a bulky body. Another dinosaur found in Teruel province is Turiasaurus riodevensis, who was also a sauropod dinosaur, is believed to be the largest dinosaur ever found in Europe, and is among the largest dinosaurs known to date, at 36–39 metres in length and with a weight of 40 to 48 tonnes. The first prehistoric animal stamps of Armenia. International sales of Armenian post located in USA and sale Armenian stamps with about 50% overprice from face value. According to Armenian post, FDC will be issued later in January 2018. 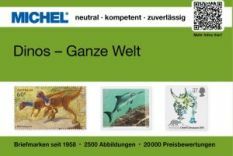 [PP1] On February 1st 2017, private German post "Briefmarke und mehr" in cooperation with Natural History Museum in Muenster, issued set of 6 stamps to commemorate 125 anniversary of the museum. The stamp issued in 3 mini-sheets 2x5 stamps each. [PP2] Self adhesive stamp of "Suedwest Mail" private postal company of Germany. The stamp issued on self adhesive sheet of 10 and shows Mammoth figure from mammoth ivory of the Lonet Valley - 40,000 years of ice age It is only four centimeters in size and still a scientific and art-historical sensation - the ivory mammoth from the Vogelherdhöhle near Niederstotzingen in the Lonetal. 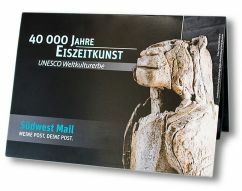 On August 1st, Suedwest Mail issued a folder with 4 stamps "40 000 years Ice age art, UNESCO heritage". 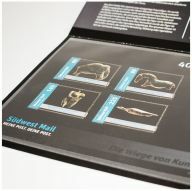 This folder contain a mammoth figure stamp issued at the end if July and three new stamps: the venus of the Hohle Fels cave, the horse of Vogelherd cave, the water bird of Hohle Fels cave. The lion man of the Hohlestein-Stadel cave shown on the front page of the folder. All figurines are carved out of mammoth ivory. 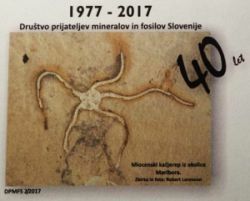 [SP1] On occasion of 40 anniversary (1977-2017) of the Friends of Minerals and Fossils Association of Slovenia, two personalized self adhesive stamps and two correspondent FDC are issued. 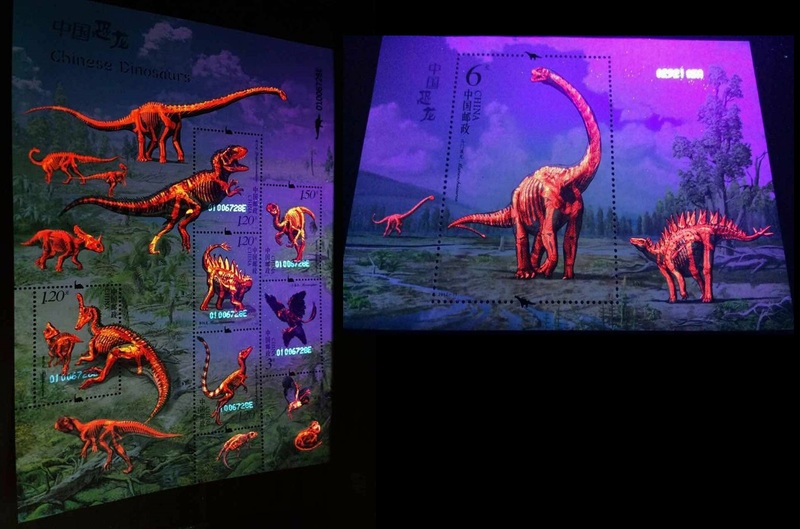 [SP2] First dinosaur stamps of Azerbaijan issued by Stamperija on behalf of the country. [SP3] Personalized stamps issued by Chinese Post (GTY2017-05). The reason for this issue is unknown, the same month Chinese Post issued official set "Chinese Dinosaurs". [A1] "UNESCO World Heritage Sites" stamps issued as mint mini-sheet and self-adhesive booklet of 10 and 30 stamps. The first two stamps on the mini sheet and the booklet shows famous fossil found locations: Dinosaur Provincial Park in Alberta and Mistaken Point. The first stamp shows Dinosaur Provincial Park in Alberta, known for its remarkable fossil specimens that represent every known group of Cretaceous dinosaurs, as well as its impressive area of virtually undisturbed badlands and riparian (riverside) habitat. 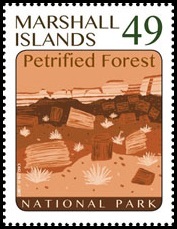 The stamp has similar design to Dinosaur Provincial Park stamp issued in 2015, but it is smaller in size. On the stamp from 2015 the name of the park is written in white font on the foreground just over country name on the buttom left corner. On the stamp from 2017 the name of the park is written in tiny balck font in the middle of the stamp. 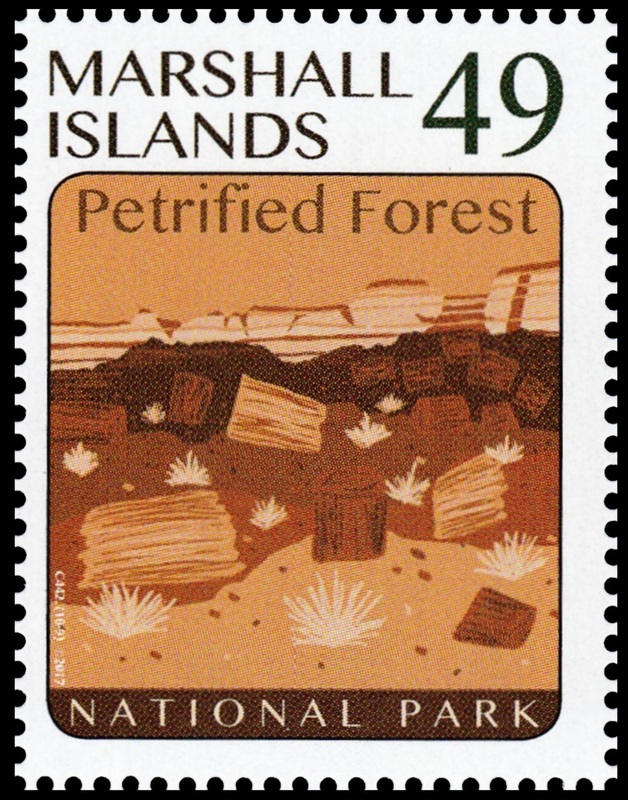 The second stamp shows Mistaken Point, the rugged coastal cliffs host the oldest known collection of large fossils in the world, marking the world’s first appearance of large, biologically complex organisms. Some fossil is also visible in big zoom. This fossil site is located at the south-eastern tip of the island of Newfoundland, in eastern Canada. It consists of a narrow, 17 km-long strip of rugged coastal cliffs. Of deep marine origin, these cliffs date to the Ediacaran Period (580-560 million years ago), representing the oldest known assemblages of large fossils anywhere. [A2] Royal Mail starts its 2017 Stamp Program with a subject that has not previously been featured as a stand-alone topic: how people lived in prehistoric times has always been a fascination for many and the Ancient Britain stamp issue explores this subject in some detail. The stamps show famous iconic sites and some of the most exceptional artefacts found across the UK, and overlays illustrations to show how people lived, worked and used the objects. We also explore the social and technological evolution of these early Britons. The first metals were used in Britain while still in the ‘Stone Age’. The arrival of cultures that could ‘make metal’ would have a dramatic effect on society. In the British Isles the first seams of copper were exploited in Ireland around 2500BC. The discovery of tin in South West England helped to make Britain an important centre – copper smelted with an amount of tin makes the superior metal bronze: harder, more durable and versatile and the so-called Bronze Age saw several other technological advancements. Overall, the stamps give a timeline across thousands of years of history, from a glimpse of Stone Age ritual of 11,000 years ago, through the Bronze Age and into the Iron Age of some 300 BC. 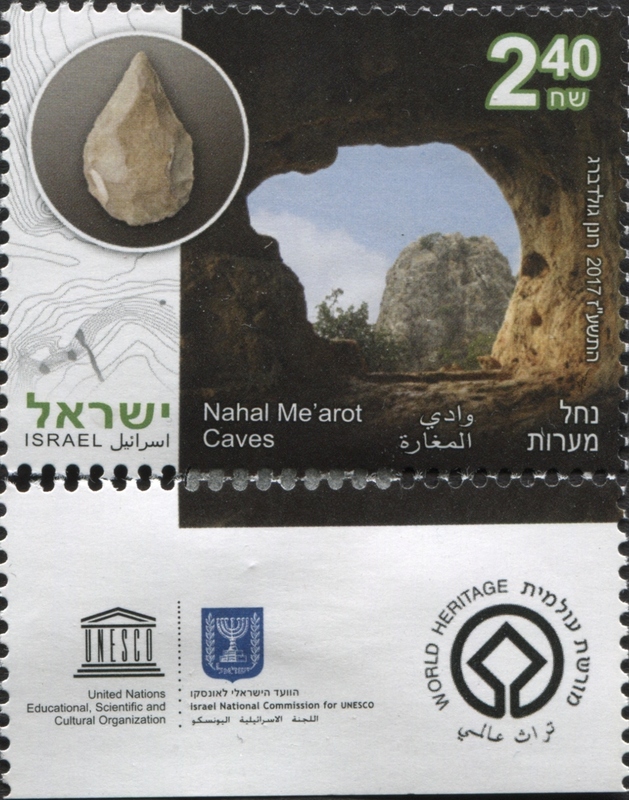 [A3] Three stamps showing UNESCO world heritage sites of Israel. One of them depicting a beautiful prehistoric stone tool from Nahal Mearot Caves in Israel. Four caves (Tabun, Gamal Nahal and Es-Skhul Cave) are carved into the mountain on the southern slope of Mount Carmel, at the entrance to the Nahal Me'arot Caves. Archeological excavations conducted at the site from 1928 to the present have discovered evidence of human existence near and inside the caves over hundreds of thousands of years. Among the many findings were remnants of houses, various stone tools, jewelry, bones of animals used for food and graves. 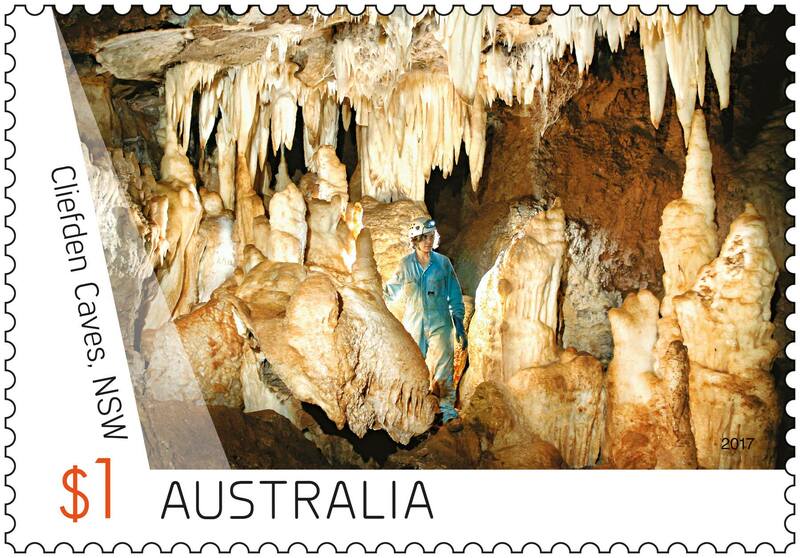 [A4] This stamp issue presents four highly significant caves from around Australia. Each stamp provides us with a glimpse into these spectacular underground environments. One of the stamps shows Cliefden cave. [A5] In August 2017 South Africa issued "National Partks III" stamps set. The five stamps depict the Golden Gate Highlands National Park, Tsitsikamma at the Garden Route National Park, Camdeboo National Park, Table Mountain National Park and Bontebok National Park. The stamps are postage for registered letters, costing R27.50 each. Three of these parks are also known as important fossil found places. The Camdeboo National Park is located in the Karoo and almost completely surrounds the Eastern Cape town of Graaff-Reinet. Camdeboo National Park was proclaimed as South Africa's 22nd National Park under the management of South African National Parks on Sunday 30 October 2005. It covers an area of 194 square kilometers. [A6] Oldřich Pošmurný was born on 8 April 1942 in Tábor. He studied graphic design of books and magazines with Prof. Vladimír Ringes, history of book design with Prof. František Klikar, and illustration and figure drawing with V.J. Žižka. After graduation Oldřich Pošmurný worked as a graphic editor in the Svoboda publishing house. From 1968, he worked as a free-lance graphic artist. He co-designed the series Zdeněk Burian’s Ancient Dinosaures and designed Dinosaur's stamps of Czech Republic in 1994. [F1] In the middle of 2017 these prehistoric animal stamps appeared on internet as local stamps of Guácimo. Guácimo is the capital of Guácimo, Limón Province in Costa Rica., similar to the rest of the counry only official stamps used there. [C1] commemorative postmark of "Altamura Man", shows reconstruction of its famous find made by Kennis&Kennis. [C2] Postmark from "Dinosaur Eggs" station. [P1] postal stationery "200 anniversary of The Senckenberg Natural Research Society". Skull of Triceratops and reconstruction of 'Lucy' (Australopithecus afarensis) shown on left side of the cover. [P2] To the 175 anniversary since the birth of the scientist and philosopher P.A. Kropotkin, Post authority of Russia issued the post stationery and two postmarks with his portrait: one from Moscow and another from St.Peterburg. Kropotkin Pyotr Alekseyevich (1842-1921) was a geographer, the geologist and the traveler, the researcher of Siberia and Priamurye, one of founders of paleogeography of an anthropogene, the creator of the doctrine about ancient continental freezing, who proposed the theory of Pleistocene ice age, alternative theories of evolution based on embryology. He traveled in eastern Siberia and Manchuria from 1863 until 1867, and his subsequent publications about that area's geography became authoritative until the middle of the twentieth century. Kropotkin argued that his geographic and geologic observations in Asia, Finland, Sweden, and Canada, supported the theory of Pleistocene continental glaciation, often called the ice age. He was one of the first to study the ancient geography and climate of the Quaternary period, which spans from 2.5 million years ago until the present. Around the turn of the nineteenth century, Kropotkin offered what he said were complementary amendments to Charles Darwin's 1859 theory of evolution by natural selection. Kropotkin employed a variety of arguments from natural history, embryology, and geography to support his theory of mutual aid, which he argued was a positive mechanistic addition to the theory of evolution. [P3] 150 anniversary of Grigore Antipa, who was the zoologist, ichthyologist, Hydrobiology, economist, ecologist, oceanology, museology. He was director of the Museum of Natural History in Bucharest, where he had an important contribution to the organization on a phylogenetic and ecological collections. As a token of gratitude for his work in the museum since 1933, Museum of Natural History bears his name. Imprinted stamp on the post stationery shows logo of the museum with silhouette of Mammoth. 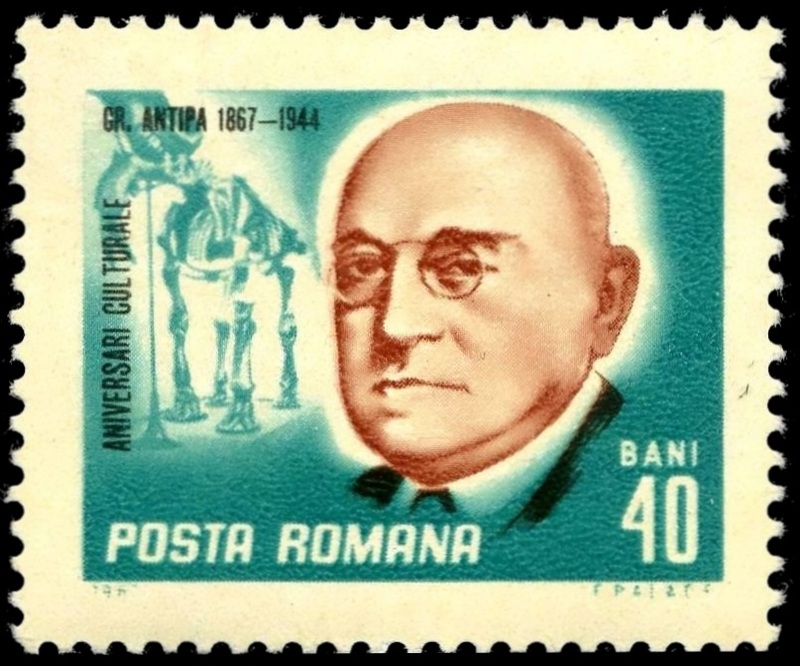 The mammoth and Dinotherium giganteum (depicted for the first time on Romanian stamp in 1967) are most impressive and popular artifacts of the museum.